Savannah cats are a spotted domestic cat breed started in the 1980's. Developed to give the impression of grandeur and dignity of a wildcat with a cheetah type appearance, expressive eyes highlighted by dark tear stains, vibrant coat colors, solid contrasting black spots, huge sonar-like ears and long legs. Since 2006 they have held the Guinness Book World Record for the world's tallest domestic cat. Breed standard calls for all traits to mimic those of its ancestor the African Serval. The goal of the breed is to obtain a well-rounded temperament yet wild-looking breed that makes a suitable alternative to an exotic pet. Poorly developed bloodlines can be mistaken for Bengal Cats, which have an opposite body structure to the Savannah. Energy Level of the breed is medium to high so exercise is required. Exercise combined with socialization is an extremely important part of a kitten's training into adulthood. Exposure to friendly atmospheres with positive reinforcement work best. Health Issues are not specific to the breed at this time. Genetic testing is crucial to avoid development of breed-specific ailments long term. Reproduction is very difficult and fertility rates are low. Litters average 1 to 3 kittens in higher generations. Some cats are infertile due to genetics. Intact cats are notoriously selective, pairing only with those it is raised with from kitten-hood. The gestation period of the African Serval is 10 days longer than a domestic cat, meaning F1 & F2s are immensely hard to produce. Savannah Cats do not require any special health care. They visit a regular veterinarian for routine feline health maintenance. High intelligence combined with being naturally curious gets them into mischief. Due to high intelligence, curiosity and high energy needs, they are best suited with active owners. Temperament is outstanding when properly socialized. The feline version of a dog. Ideal companions for owners who want to avoid extra canine requirements. Actively seeking social interaction. They are given to pouting if left out. Remaining kitten-like through life. Profoundly loyal to immediate family members. Questioning the presence of strangers. Making excellent companions that are loyal, intelligent and eager to be involved. Demonstrated by the ability to learn simple to complex commands. Nutrition requirements are the same as the average domestic cat. Almost all cat foods from a grocery store are not properly balanced for any type of cat. Feeding a cheap filler filled foods will lead to bones being brittle bones that can break easily. These cheap foods have been linked to diarrhea, weight loss and even cancer. Savannah Cats grow at a fast rate so proper nutrition is vital. They do not require a raw meat diet however a raw meat diet is the most nutritional diet available if properly prepared. Work with your veterinarian and breeder to determine the frequency of meals. Dry Food and fresh water should be available at all times. Colors of the Savannah Cat are brown, silver, black and smoke. Acceptable colors are those that mimic the African Serval. The most common variation of the African Serval is a buttery gold color with solid jet black spots. Gold is a shade of brown so it is correctly registered as a brown spotted tabby (BST). Eyes should be medium-sized and set underneath a slightly hooded brow. The top of the eye resembles a boomerang, which is set at an exact angle so that the corner of the eye slopes down the line of the nose. The bottom half of the eye has an almond shape. The eyes are moderately deep set, low on the forehead, and are consistent with facial symmetry. Tear stain markings are present along and between the eyes and the nose. All eye colors are allowed and are independent of coat color. Ears should resemble those of the African Serval Cat. African Serval Cats have the largest ears of all felines, and largest ears in relation to head size of any cat. As a result, the Savannah Cat's ears are remarkably large and high on the head. The ears are also wide with a deep base. The ears should be upright and have rounded tips. The outside base of the ear should start no lower on the head than at the height of the eyes but may be set higher. The inside base of the ears is set close at the top of the head, ideally, vertical parallel lines can be drawn from the inner corner of the eyes up to the inner base of ears. Savannah Cats have inherited "ocelli" marks behind thier ears used to scare off predators. Ocelli marks can be found throught nature, Such as the wings of butterflies, ears of most wild cats and even tabby cats. Serval Cats have an "ocelli" marking behind the ears which are high-contrast marks that are thought to scare off predators by mimicking the eyes of the predators' own enemies. Savannah Cats often a muted ocille mark with less contrast. Lacking the high contrast of black with white color combination. It is considered desirable to have black with white but not a fault to have lesser contrasting colors (black with brown, brown with brown). Head should be broad, modified wedge with rounded contuers. The head should be longer than it is wide. The anterior view of the face should present a distinct and symmetric triangular shape. The nose is long with a small chin. It is preferred for the head to have the “l l” marking rather than “M” marking, although this is not in the breed standard. Pattern is solid dark spots which can be round or oval flowing across the body and should not be connected. A series of parallel stripes, from the back of the head to just over the shoulder blades fan out slightly over the back. Smaller spots may be found on the legs and feet, as well as on the face. The coat is dense short hair that can be coarse or soft in texture. Generations represent a number of pairings removed from an exotic ancestor. Generations matter to breeders because stud males are not fertile until six generations removed from the Serval Cat due to “hybrid infertility”. Breeders acheiving higher percentage SBT cats are finding fertility impacted, now males are much less likely to be fertile four or five generations removed. 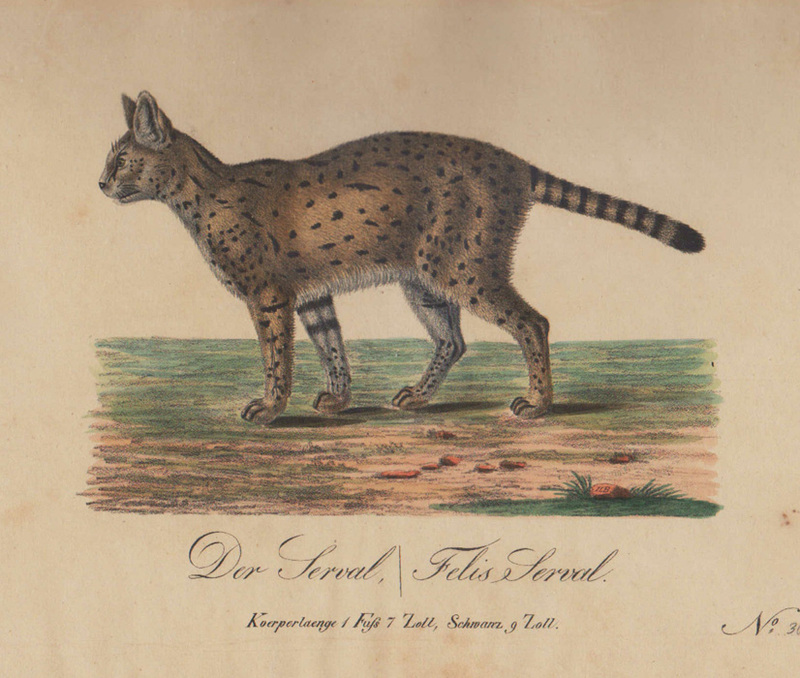 The F1 generation is the foundation of the breed (Serval x Domestic), all other generations are subsequent pairing of a Savannah male pairing to a Savannah female. Out-crossing to different breeds such as bengals or oriental shorthairs is not premissiable but done on the rare occasion to bring in new bloodlines. New bloodlines may be sought out to obtain a larger gene pool or obtaining hard to achieve desirable genetic traits. Out-crossing should be attempted with serious caution as all breeds have pros and cons to be considered. Bottle feeding of generations with higher exotic heritage ensures obtaining a sound temperament. Bottle raised kittens are left with mom during the first few weeks to ensure vital antibodies are received. Bottle raising is required in the first generation. The average domestic cat pregnancy is around 63 days and the African Serval Cat pregnancy is around 74 days. Having a ten-day gestational difference can result in some F1 kittens being slightly premature. Premature kittens require intense specialty care during the first few weeks. This complex process results in higher prices due to the time and skill level. It is important to note that any cat breed not provided proper socialization will result in maladjusted social habits. Hybrid infertility is when a hybrid cross can not reproduce. Joyce Sroufe, the founder of the breed, retained all generations attempting to get fertile males. Joyce Sroufe was unsuccessful until five generations removed, her pairings were all out-crosses that resulted in little exotic content. In theory this content needs to be 10% or less. As the breed progresses pairing become higher content resulting in males further removed to retain fertility. If a higher content male is found fertile often they have small litters and becomes sterile over a short period of time (Often within a year of proven fertility). Leash training often is tried with success on Savannah Cats. Leash training on a harness is possible with Savannah Cats. Walk on a leash with a harness does take practice and patience. In fact Savannah Cats are so intelligent that potential owners should make sure they have the time to provide proper mental stimulation. Allergies still happen around Savannah Cats even though they are short haired cat breed. No cat breed is truly hypoallergenic. No scientific data supports hypoallergenic cat breeds. Most allergy sufferer are allergic to the protein found in cat saliva not hair, so they are allergic to all felines. Lifespan of domestic cats can live up to 15 years, typically 10-12 years. Serval Cats live up to 20 years. Savannah cats can live 12-20 years depending on heritage from the Serval Cat. It is proven that cats who eat a properly balanced raw meat mixture will have a better chance at a longer life. Size of Savannah Cats is often exaggerated because they are taller, thinner framed and longer bodied than the most domestic cats. This taller body type gives the illusion of more weight. Weight depends on individual bloodline. Weight can range between 12-25 pounds. Price is based off conformation to the breed standard, temperament, demand and scarcity. When a Savannah Cat has traits inline with the breed standard they are of higher value as a pet or breeder. Breeders are obligated as TICA registered members to provide registration papers, age appropriate vaccinations and retain kittens until the age of 10-14 weeks, which is costly. The basic rearing cost of a registered pedigree kitten results in adoption prices over $1,200 (This goes for all pedigree cat breeds). F1 & F2 generations have very small litters once a year, sometimes going long periods without birthing. This drives up the adoption cost of those generations. Please review your state laws before getting a Savannah Cat. Ancestor of the Savannah Cat is the African Serval Cat which has been actively breed in captivity since the 1920's. This wild cat native to Africa. It is rare in North Africa and the Sahel, but widespread in sub-Saharan countries except rain-forest regions. They are vulnerable to hyenas and wild dogs. In the wild they will seek cover to escape the view of a predator. If a predator is too close they will flee in long leaps, changing direction frequently and with their tail raised. The African Serval Cat is able to purr, has a high-pitched chirp, hiss, cackle, growl, grunt and meow. Compared to a Savannah Cat the African Serval Cat will cost double daily to maintain, they do not tolerate strangers, they will only eat raw meat and once full grown they will not use a litter-box. Desirable traits and exotic looks are why most owner of African Serval Cat convert to owning a Savannah Cat. Majority of Savannah Cats have less than 10% possible exotic heritage. 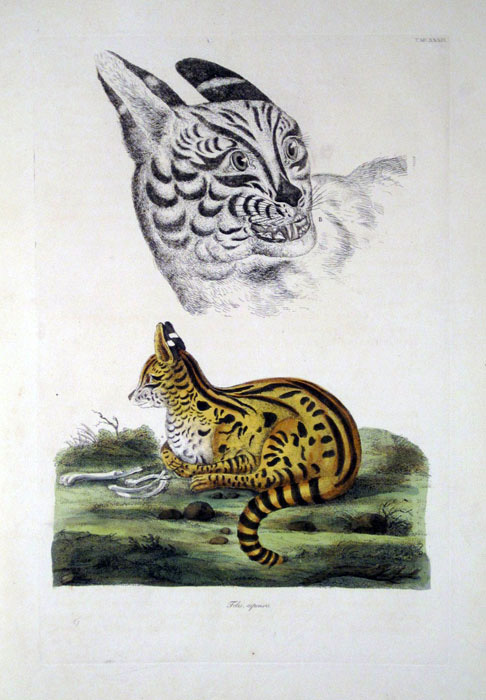 We have compiled a rare look at historical depictions of Serval Cats dating back to the 1400's, see below pictures. Can “____” Be around a Savannah? Savannahs love to play… they don’t discriminate! If your game, they are game. It may comes as a surprise that the majority of Savannah Cat Owners don't purchase for exotic looks. Rather they seek a pet with a combination of traits that the Savannah Cat has to offer. Are you thinking a Savannah Cat is the right choice? That is wonderful to hear. Visit our "Basic Care" page for more information on caring for a Savannah Cat.